Returning to that whole vacation thing . . . . If you visit Great Smoky Mountains National Park, I highly recommend biking the Cade’s Cove loop. We drove out early on Wednesday morning, when they close the 11-mile loop to cars (which they also do on Saturday mornings), and rented bikes in the park. I considered bringing our bikes with us on this trip, but realistically, this was probably the only time we would have used them, so renting was a better option. The bikes weren’t amazing, but my pedal, which was making suspicious noises, remained in one piece throughout the ride, so no complaints here. Toward the end of the ride, we spotted some bicyclists stopped on the road to watch a bear. When we first met him, he was on the ground. We stopped on the road and watched, without approaching or crowding him. He ambled along for a bit, and then found this delectable tree. He walked over to it, stood up, put his paws around it, and SHOOP — up the tree! (If you’re ever trying to get away from a black bear, I do not recommend climbing a tree!) 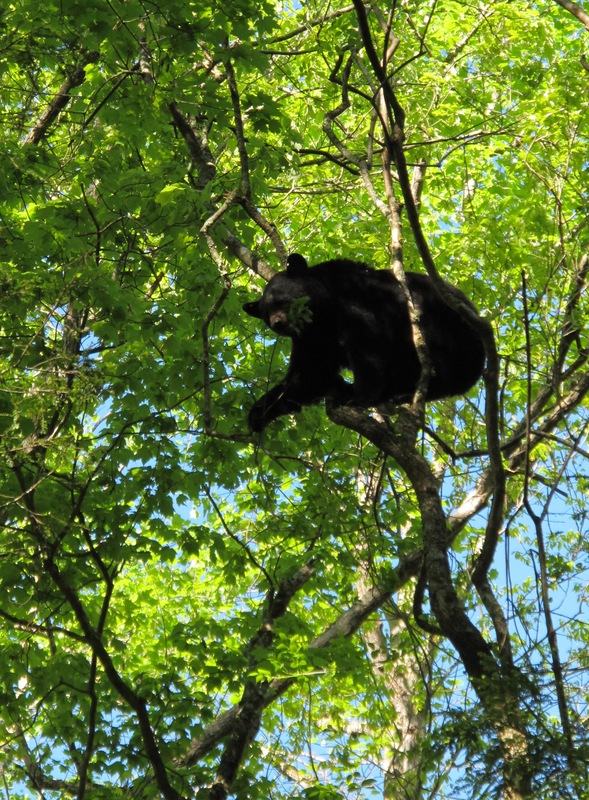 We watched, transfixed, for what felt like forever, as our bear friend chowed down on the young leaves at the top of the tree, snapping off branches with abandon, the entire tree flexing and swaying with his weight. He finished his morning snack, descended, and mosied off into the woods. Amazing! Riding a bike is the ideal way to see bears. From a car, they seem so distant and removed. Although I have yet to encounter one on foot, I imagine I would feel rather nervous in that situation, knowing that the bear could easily outrun me (and, like I said, forget climbing a tree). The bike was perfect. We were able to stop and enjoy, but if the situation went south, bike speed would have allowed us to make a quick exit. (At least that’s what I was telling myself — maybe a bear could outrun a bike?) Fortunately, the group of eight or so people who stopped with us acted very appropriately; no one tried to approach the bear or do anything that would have made the situation dangerous. 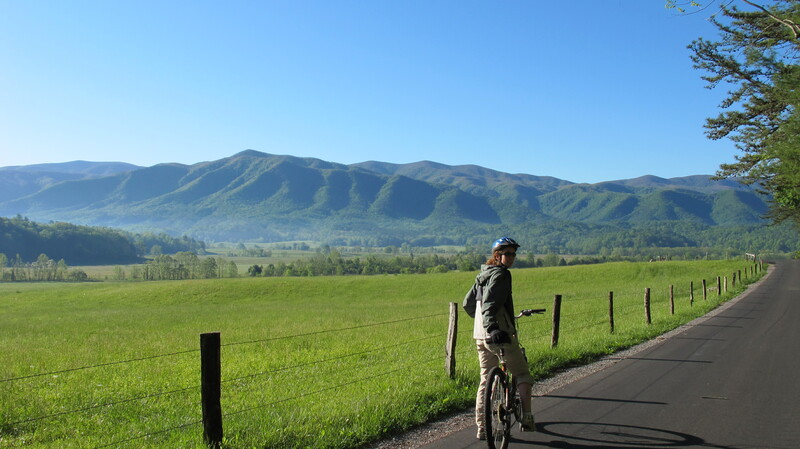 So, if you are in the Smoky Mountains, head back to Cade’s Cove and rent a bike. No guarantees that you will see a bear, but riding along the newly repaved road, out in the wild, makes for a great morning, bears or no. This entry was posted in Biking, My Life and tagged bears, Biking, Smoky Mountains, vacation. Bookmark the permalink.